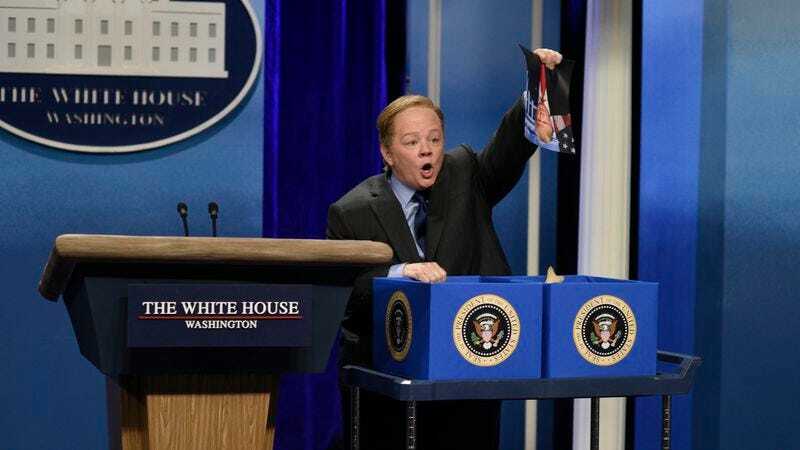 While Sean Spicer was being outwardly relatively good-natured about Melissa McCarthy’s Saturday Night Live impression of him, Donald Trump was stewing, according to Politico. Namely, he’s mad that his press secretary was parodied by a woman. The gender-swapped element of the sketch was the part that was “most problematic in the president’s eyes,” the publication reports, citing a donor who said that Trump “doesn’t like his people to look weak.” This all, of course, makes complete sense given how Trump has consistently demonstrated his loathing for women, especially those who challenge him. Also remember that he was one of the original opponents of McCarthy’s Ghostbusters reboot. So now that this information is out in the world, brainstorming has begun as to which female performers can play members of Trump’s inner circle and subsequently rile him up even more. One leading candidate: Rosie O’Donnell, who has volunteered her services and is now campaigning to play Steve Bannon. If Lorne Michaels really wants to goad Trump, he should take her up on her offer immediately and have her appear on the same show Alec Baldwin hosts.